As more design enthusiasts are gaining interest in unique pieces of furniture to add to their eclectic design spaces, bone inlay furniture from India has quickly become a favourite. Iris furnishings has played a significant role in setting this trend as their collection of Indian inlay furniture offers an interesting variety of exquisite options. Bone inlay furniture comes specifically from India’s Udaipur region where the intriguing style and intricate pattern designs of the furniture are created by craftsmen who have inherited the delicate skill of bone inlay, passed on from generation to generation. Iris furnishings does exceedingly well as a retailer of Indian bone inlay furniture due to the many years of friendship and close relationship they share with local Indian suppliers. Not only do they have an intimate knowledge of the region, but they also share the same understanding of the traditions, language, and history of the area as the suppliers. How is bone inlay furniture made? The process of creating one piece of bone inlay furniture requires three craftsmen, each handling one aspect of the process. The first craftsman carves out intricate shapes from pieces of bone, the second gets the timber frame coupled with the bone in intricate and detailed patterns, and the third craftsman crafts the background of the pieces by using resin to fill in around the bone. The entire process takes about a month to complete before a single piece of bone inlay furniture has been created. 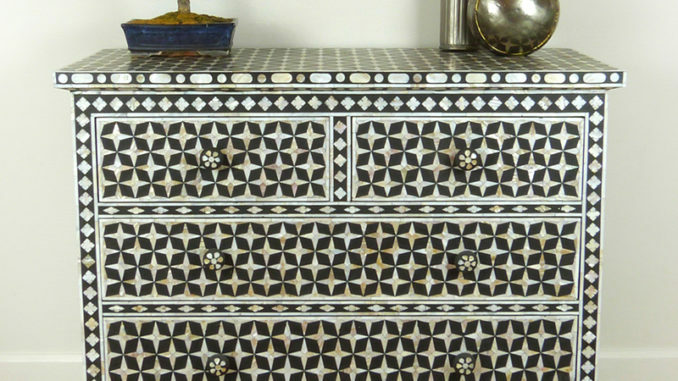 What is bone inlay furniture made of? The bone inlay furniture stocked by Iris Furnishings has been made using buffalo or camel bone taken only from animals that died naturally. While bone inlay furnishings continue to rise in demand, some buyers are not as comfortable with furniture made from bone. For this category of persons, Iris Furnishings makes available horn and mother of pearl accents. The horn used in producing the timeless pieces sold by the company are not taken from endangered species. Instead, they are taken from cows and dyed. Iris Furnishings supplies elegant Indian bone inlay furniture which are best used sparingly due to their intricate designs. They work well as attention grabbers and are often given their own space with nothing else around to compete for attention. Among the many designs available are white bone inlay pieces and black pieces, both ideal for a monochrome look. There are also many colourful options for those who prefer a pop of colour. Iris has developed a genuine passion for Indian furniture stemming from over two decades of interacting with the Indian culture. This passion has led them to become one of the leading independent retailers of fine Indian furnishings. They focus on bringing lesser-known traditions of Indian craftsmanship into the western market, which are more elegant than what most are used to. To learn more about their one-of-a-kind Indian furniture, visit irisfurnishings.com.